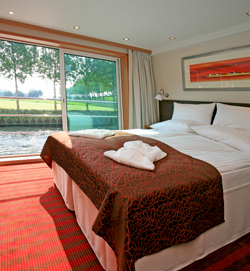 Avalon has always provided river cruisers the most spacious staterooms in Europe. With their Panorama-style Suite Ships®, they're not only offering cruisers their award-winning Avalon Deluxe Staterooms, they're featuring 200-square foot Panorama SuitesSM (30 percent larger than the average stateroom) and 300-square foot Royal Suites, offering cruisers even more room to relax and take in 360-degree views of Europe. Inspired by design, Avalon ships are crafted to entice all five senses. Some enhancements, including deluxe woven carpeting, flowers, premium L'Occitane products and scented sticks in their staterooms are subtle. Other offerings, such as Avalon-branded premium bedding (Comfort Collection BedsSM), marble bathrooms as well as a perfect balance of warm interiors, natural lighting and panoramic views are distinctive and unexpected. Combined, all elements provide travelers with a unique feeling of space, freedom and comfort not found with any other river cruise line. 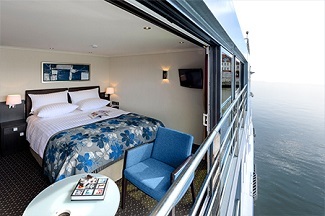 Avalon Waterways offers cruisers an exclusive, premium-bedding suite (Comfort Collection Beds) in all of their staterooms, fleet-wide, in Europe. Comfort Collection Beds provides travelers a choice of pillows as well as orthopedic mattresses, high-comfort mattress covers, European-style duvets, Egyptian super-combed cotton linens, extra blankets and bed configuration options. Peering through the looking glass to determine how Avalon can continue to improve our cruisers on-board experiences, they have invested in the finest bathroom appointments available and such luxury touch-points such as L'Occitane toiletries, quality robes and slippers in each room, fleet-wide. They've also designed contemporary staterooms with the most available storage space, and plenty of "comfort touches" like complimentary bottled water and fully stocked mini-bars. For some cruisers, comfort comes in the form of connection: staying in touch with friends, colleagues and family members while away. Because of this, Avalon has taken great strides to enhance the technology available to guests on ship. In addition to offering them flat-screen televisions, providing a plethora of news and entertainment options, Avalon provides cruisers with FREE Wi-Fi fleet-wide. On any deck, your well-appointed Avalon Deluxe Stateroom is a spacious refuge of inviting home-awayfrom- home features. Delight in the large private bathroom featuring full shower with glass shower door; deluxe beds with premium mattress covers, Egyptian super-combed cotton linens, European-style duvets, and a choice of soft or firm pillows; and ample closet space. And, of course, don't miss out on the never-ending views from the large windows or floor-to-ceiling sliding-glass doors. In fact, you'll love your Avalon Deluxe Stateroom so much, you may never want to go home!